Ever since Mustang introduced their first Skid Steer in 1965 they have been known in the industry for their strength and durability. Monster Tires offers sets of tires that can hold up to the power and performance and the best prices on Mustang Skid Steer Tires. When you work with the knowledgeable staff here at Monster Tires we can answer any questions you have about which set of tires, tread pattern and anything else you may need to know about what Mustang Skid Steer Tires would be best for your machine. Here at Monster Tires, our goal is to make sure that all of our customers know exactly what they are getting when they buy tires from us, and that there are no questions or miscommunications about exactly what the customer needs. We balance top quality with affordability here at Monster Tires. It is important for you to have the quality you need to be able to do difficult jobs even under adverse conditions. It is also essential that you be able to afford the tires you need. That is why we have the lowest prices on the best Heavy Equipment Tires to get your piece of equipment rolling again. 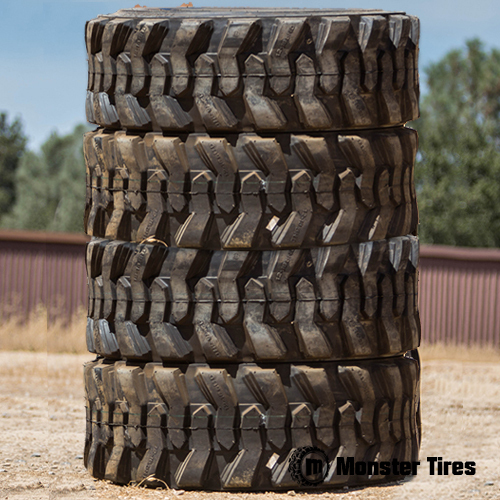 Trust in Monster Tires for your next set of Mustang Skid Steer tires!